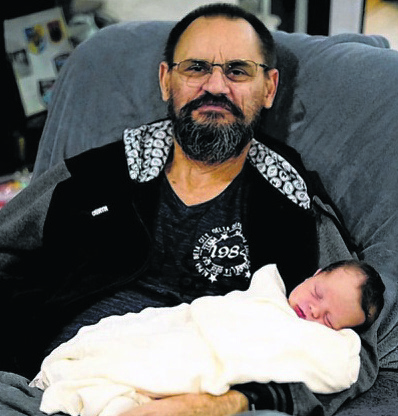 A Funeral Mass for the repose of the soul of the Late Mr Michael John Angelinovich of Padbury, formerly of Merredin will be celebrated at St Mary's Catholic Church, South Ave, Merredin on Saturday (13.04.2019) at 11:00am. 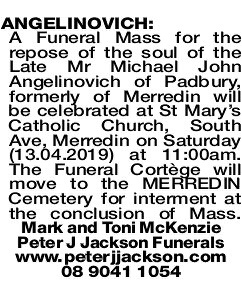 The Funeral Cortège will move to the MERREDIN Cemetery for interment at the conclusion of Mass. 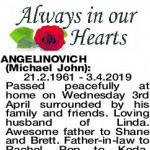 Sad condolences to the Angelinovich family on the passing of Michael, Thinking of you all. Tom and Olga Kittyea, Harold, Fiona and family. 21.2.1961 - 3.4.2019 Passed peacefully at home on Wednesday 3rd April surrounded by his family and friends. Loving husband of Linda. Awesome father to Shane and Brett. Father-in-law to Rachel. Pop to Koda. Loving son of Marty and Jean. 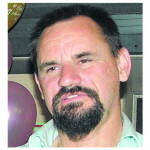 Brother to Carey, Julie, Wayne and Raymond. Will be sorely missed by everyone who knew him. 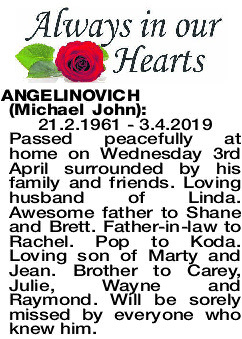 ANGELINOVICH MICHAEL To a loving Father and proud Pop, we will miss you dearly. Thank you for everything you have taught me as a father now. Forever in our hearts. Brett, Rachel and Koda. 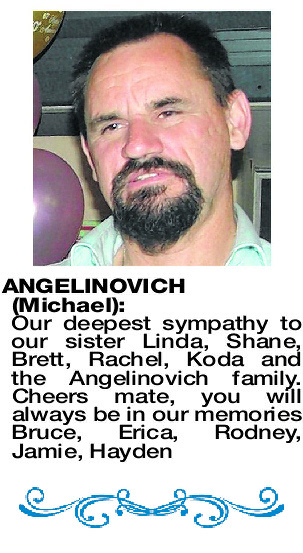 To my sister Linda, Shane, Brett, Rachel, Koda and the Angelinovich family, Michael was a great man. So many memories. 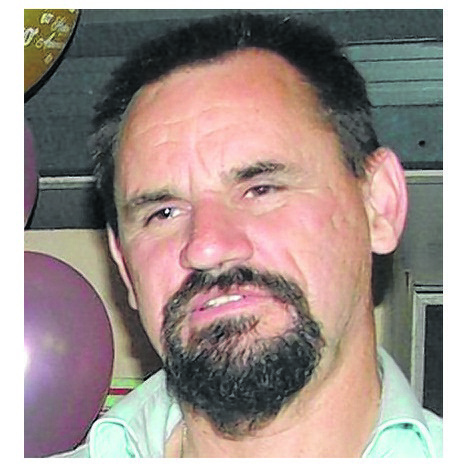 Deepest sympathy to Linda and family on your sad loss of Michael. Our thoughts are with you at this difficult time. Our sympathy goes out to Linda and the whole family on the sad loss of Michael. A loving family man and husband. Ripper and Faye.